Mark Tyler in action for Luton against Posh earlier this season. Peterborough United have failed in a surprise attempt to re-sign goalkeeper Mark Tyler from Luton Town. 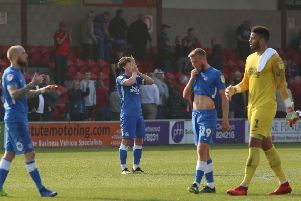 Tyler, a true Posh legend, has made the second highest total of appearances for Posh in the club’s Football League era. He made 486 appearances for the club in a 16-year spell that ended in 2009. The 38 year-old has played regularly for League Two Luton Town this season, He delivered a man-of-the-match performance when Posh beat ‘The Hatters’ 2-0 in an FA Cup second round tie in December. Tyler has made over 250 first-team appearances for Luton and helped them win promotion from the Conference in 2014. The Peterborough Telegraph understands the deal has been in the offing for several weeks, but that talks broke down over the weekend after Luton demanded a fee for the veteran number one. The Posh plan was to use Tyler as back-up to first choice Ben Alwnick with young goalkeeper Dion-Curtis Henry going out on loan.